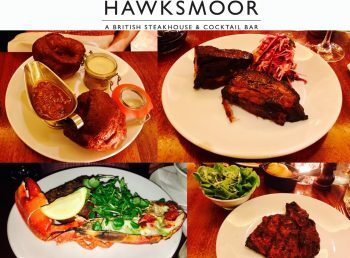 From a labour of love to find the perfect beef, Hawksmoor were inspired to open the best steak restaurant. They are now amongst some of the best restaurants in the UK! Tucked down a quiet street, a few minutes walk between covent garden station and Seven Dials, the bar is the perfect place for burgers, lobster rolls or a casual steak dinner. The menu revolves around the best ingredients that can be found, from grass fed native cattle to sustainable seafood from around the British coast, the food at Hawksmoor is served by a team of friendly people who obviously love what they do. On my visit I tried Tamworth belly ribs (11.50) and Potted beef & bacon with Yorkshires (8.75) to start and the Rib-eye (400g) (31.50) and Surf ‘n’ Turf (Fillet (300g) & Grilled Half Lobster with Garlic Butter) (50.00) for the main courses. An Express Menu is also available 2 courses £25.00, 3 courses £28.00 (Available until 6.30pm and after 10pm Monday to Saturday) and provides the perfect pre/post theatre dining option with fast and friendly service.